Full Circle sent me some of their handy products for review. 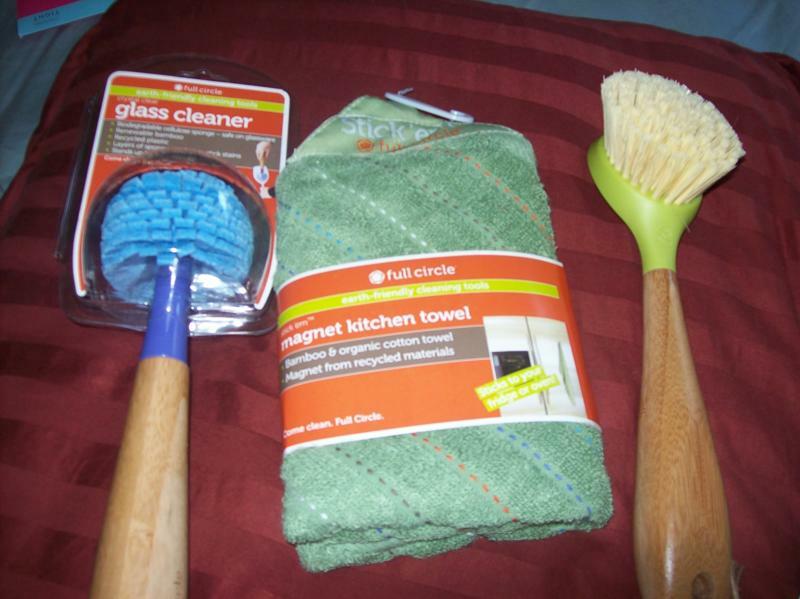 I got to try the magnet kitchen towel, the glass cleaner, and the dish brush. All of these products work great and I love them! They are all made from sustainable and renewable sources. I especially think that the glass cleaner is very handy because it fits perfectly into a wine class to clean it. This is great because a lot of times, I cannot really fit my hand into the glass when washing it. Also, the kitchen towel is very handy because it can stick right to your fridge. "In the US alone, if one scrub brush per household gets thrown out every year, that’s about 120 million brushes ending up in the garbage. Well, that’s pretty much the thinking behind Full Circle." I love this concept and am happy to have gotten to try these products. You should try them! Thanks Full Circle. Thanks for the review Amanda! Glad you liked the products and I hope your readers will as well! Found you over @ Mingle Monday! I'm your new follower! Come visit and follow back! Hi, Thanks for stopping by Spoiled...but Not Rotten! You have a new follower! Thanks for coming along for the ride with us! See you next week and hope you have a good one. Stopping by from the Tuesday Blog Hops! Hope to see you hop back by! Be sure to also join my blog hop today!